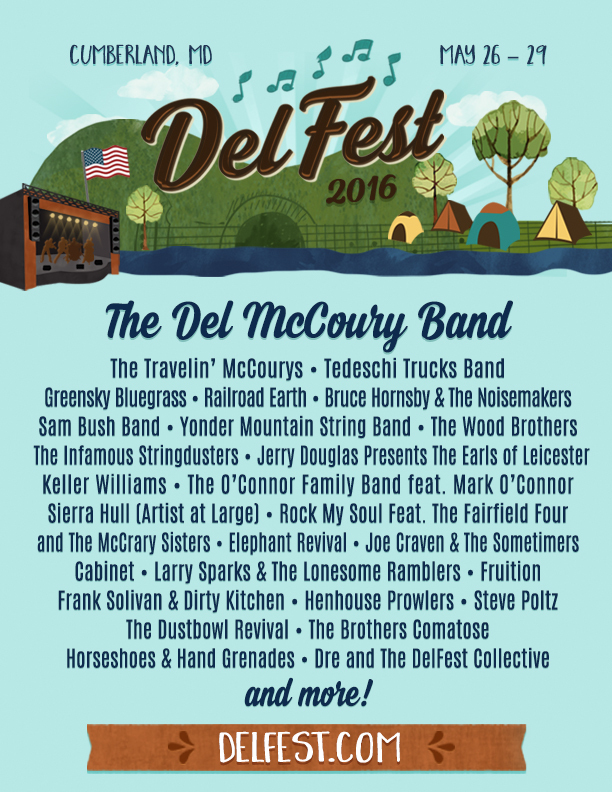 DelFest absolutely NEVER disappoints, but this year may be hosting its best lineup yet! Of course, The Del McCoury Band will be headlining, and joining them are The Travelin’ McCourys, Tedeschi Trucks Band, Greensky Bluegrass, Railroad Earth, Bruce Hornsby & The Noisemakers, Sam Bush Band, Yonder Mountain String Band, The Wood Brothers, The Infamous Stringdusters, Cabinet, Fruition, Keller Williams, Jerry Douglas and so many more! See below for the full lineup. The festival will take place in its usual home in Cumberland, MD on May 26-29, 2016. This entry was posted in Festivals, Just Announced and tagged Bluegrass, Bruce Hornsby, Cumberland, Del McCoury, DelFest, DelFest 2016, Festival, Festival Season, Greensky Bluegrass, Jerry Douglas, Maryland, MD, Music Festival, Railroad Earth, Sam Bush, Tedeschi Trucks Band, Yonder Mountain String Band.